The Navy is continuing its efforts to control commercial over-water structures in Hood Canal. The idea is to buy subtidal conservation easements from the Washington Department of Natural Resources, which owns these deep-water areas. 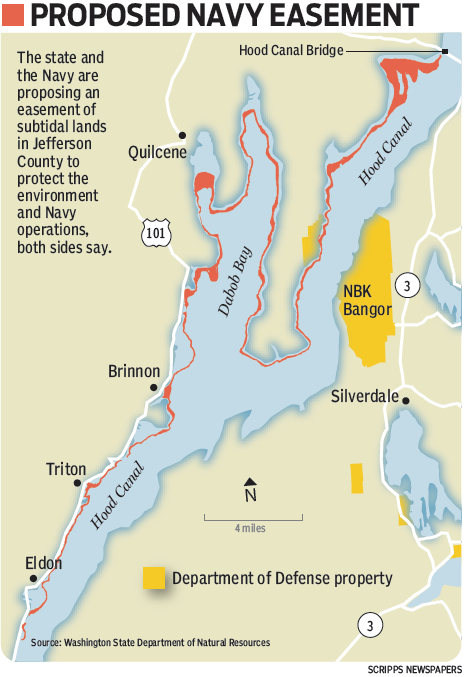 The first easement was proposed for the Jefferson County side of Hood Canal (map at right). The easement application is now working its way through a formal review process. The proposal received a lot of attention when it was announced in May, in part because of the potential to derail the controversial pit-to-pier project. A story I wrote for the Kitsap Sun on May 15 describes the overall goals of the Navy’s program and its potential effects. 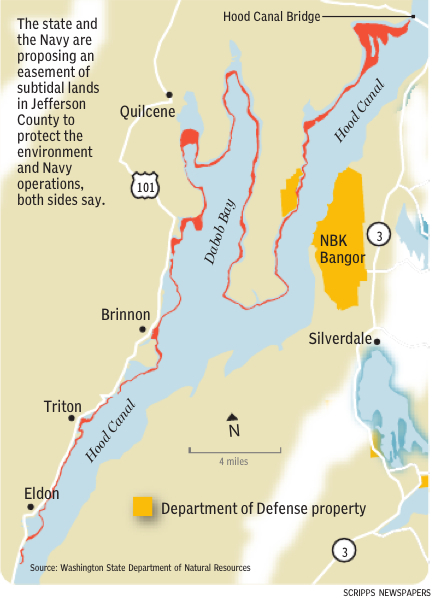 After that initial announcement, I was surprised that the Navy and DNR seemed reluctant to talk about the next phase, which turned out to be a second easement along the Kitsap County shoreline from the Hood Canal bridge to the county line near Holly. I described that proposal in a story I wrote for the Kitsap Sun yesterday (subscription). Both proposed easements fall under the Department of Defense Readiness and Environmental Protection Initiative (REPI). I’m not sure where the Navy will go with its next easement proposal. Work continues on upland properties in some areas. See reporter Ed Friedrich’s story about a related agreement two years ago, when the Navy began buying easements in the Dabob Bay area of Hood Canal (Kitsap Sun, Oct. 8, 2011). Officials are saying almost nothing about the next steps. But I have seen a map that purportedly shows the “area of interest” regarding the Navy’s REPI efforts. The area outlined includes all of Hood Canal and the regions around Indian Island, Keyport and Bremerton. The Navy had an initial allocation of $3 million in 2011 for encroachment protection, and additional funds were added in 2012 and 2013, according to Liane Nakahara. Partners in the endeavor so far include DNR, The Nature Conservancy and the Trust for Public Lands. For background on how the partnership works, check out “Partner’s Guide to the Department of Defense’s Readiness and Environmental Protection Initiative” (REPI)(PDF 1.9 mb). For the Jefferson County easement, the DNR issued a “determination of nonsignificance” during the environmental review. An appraiser has been hired to estimate the value of the easement and determine what the Navy should pay the state for lost revenue. Thorndyke Resource, which proposed the pit-to-pier project, has been pushing for increased environmental review, rather than the limited review undertaken so far by the DNR. It appears that if the proposal moves forward, the Navy and DNR are likely to face a lawsuit from the company. An easement requested by the Navy to prevent industrial development along the western shoreline of Hood Canal appears to be the first of its kind in Washington state. One can envision this easement as a strip of underwater area from the Hood Canal bridge south to a spot just south of the Jefferson-Mason County line near Eldon, as I described in a Kitsap Sun story on May 15. In most areas, the protected bedlands will be defined by their depths, from 18 feet below the average low tide to 70 feet down. More than 4,000 acres of state-owned bedlands would be covered by the easement. “The practical effect of the agreement will be to preclude new near-shore commercial or industrial construction along the areas of the Hood Canal and neighboring waterways managed by DNR where the Navy operates,” states a joint press release issued by the Navy along with the Washington Department of Natural Resources. It was quickly recognized that this could mean the end of the controversial pit-to-pier project for loading gravel onto ships and barges. If the developer, Thorndyke Resource, is unable to obtain a state lease for the proposed pier, the project would be dead in the water. The company, which has been working on the project for years, does not intend to give up without a fight. Since the story first came out, the Navy has been preparing to conduct an appraisal, which will involve hiring an independent contractor, according to Liane Nakahara, spokeswoman for Navy Region Northwest. Once the appraisal work begins, it will take at least a couple months to complete, she said. Then the Navy and DNR must each approve the appraisal results. I can’t imagine how difficult it will be to estimate how much money the state could lose by locking up this strip of underwater area for decades. If the pit-to-pier project were a certainty, then it would be easier to figure out how much revenue the state would lose by blocking that one lease. But what would be the probability of the pit-to-pier project getting all the required permits if the easement were not a factor? What other types of development would be foreclosed by the Navy’s easement along Hood Canal, and where might these projects be located? If one could assume that the Jefferson County shoreline of Hood Canal would never be developed with marinas or piers anyway, then the loss would be zero and the Navy’s easement would be cheap. These are the questions that will drive an appraiser crazy.